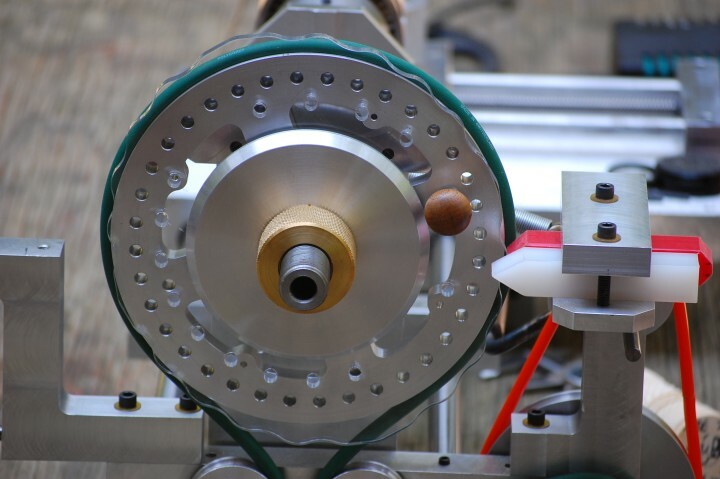 The Rambling Rose Engine is designed for a 9.5" maximum dimeter rosette cam. Most custom cams are designed and cut close to the maximum size. The bigger the cam the easier the spindle head motion will be. This is especially true for radical rosette cam designs. The rosette cams are also drilled with 1/8 and 1/3 phase adjustment index holes so different indexed spiral rates or pattern repeats can be obtained in relation to the rosette cam lobe phase. Simply unscrew the knurled brass cam nut and change rosette cam, add rosette cams or change the phase of the rosette cam. This design allows use of as many as three rosette cams or combination of rosette cams at the same time. The shape of a rosette cam can be determined by doing a little geometry and drafting using the desired final design size and shape and rosette cam diameter. This procedure is reviewed in an article by Amateur, "Making A Rosette from a Pattern", in the Society of Ornamental Turners Bulletin #46 page 22 March 1972. In summary, one complete phase of the rosette cam shape must be cut. This can be done by hand or any method you can devise. I used a milling machine and band saw to cut several. My friend, Roland Hege, cut several Sine wave shapes for me with a CNC milling machine. If one rosette cam lobe can be somehow formed, the rose engine index feature can be utilized to repeat that one cam lobe around the a rosette cam with the rose engine itself. A rosette cam design can easily be cut inverted with the Rose Engine by clamping the rubber on the rubber rest on the opposite side of the cutter and duplicating a cam. The rosette cam lobes then become valleys and the valleys become lobes. The the valley cut of a rosette cam will not have a smaller radius than the radius of the cutter.